This summer, Amy and I talked a lot about what we wanted for our students. While there were lots of complex ideas tossed around, we knew that our goals boiled down to two simple ones: for our students to become real writers and real readers. We had lots of structures in place to help our students become authentic, fluent readers–weekly reading homework, daily booktalks, reading conferences, reading workshops, and more. But writing was a bit different. Daily quickwrites and longer compositions were already in place, but I wanted to add something more to get students writing more regularly outside of class on topics of their choice. I wanted them to gain the same fluency with writing that they did through their weekly reading homework. So, I was reminded of something I used to require my AP and Honors English students to do–a weekly one-pager. Every Monday, a one page, single-spaced, typed paper was due. I offered topic suggestions, but ultimately, students could choose what to write about. I decided to revive this routine, inspired by Kelly Gallagher’s powerful claim that students should be writing four times as much as teachers could ever assess. 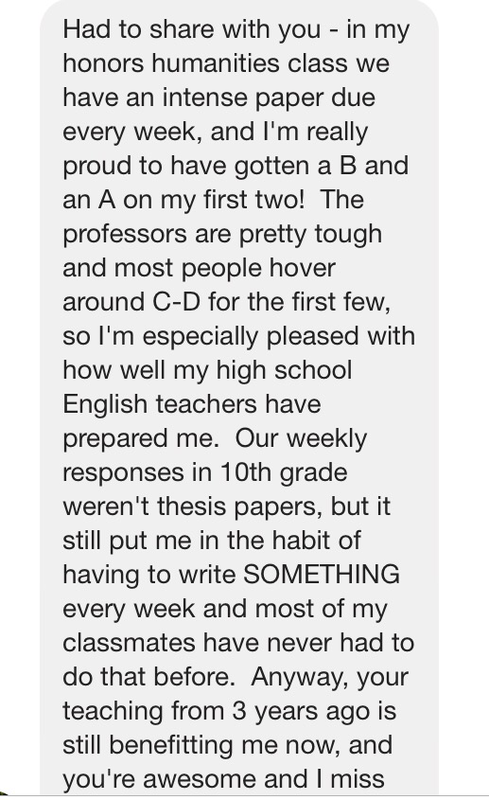 Why shouldn’t all students–not just the AP and Honors level students–write this much? This year, I only have one Honors class, but all four of my English classes write weekly one-pagers. We have a section in our notebooks called “Weekly Writing,” which is rapidly filling up with writing on a variety of topics. During bi-weekly notebook collections, I check to see that these weekly one-pagers are being completed, but I don’t “grade” them–that’s not the point. The point is to build writing fluency. These one-pagers are low stakes–ten points apiece, so on a particularly busy week, if students just don’t have time to write, it’s no big deal. But the frequent follow-up and sharing activities we do in class with these writings, combined with the autonomy students have in their topics, make the missed one-pager a rare occurrence. I was initially inspired to create this routine by some of my greatest college professors, for whose classes a written response was due each day. Alan Frager’s “study guides,” Tom Romano’s “one-pagers,” and Don Daiker’s “reading responses” were handed in at the start of each class period. By writing a short paper every single day for most of my college years, I developed incredible writing fluency. I knew I wanted my students to develop this written fluency as well, partially in preparation for their own college experiences, but also to bridge the gap between a writer’s thoughts and his words on the page. As evidenced by Janelle’s testimony above, building this writing fluency pays off. Already this year, students are remarking that it’s becoming much easier to write a full page, after only writing eight of them thus far. I’m enthused by the growth I see in all my students’ writing fluency, and looking forward to seeing how much they can develop as writers by the end of this school year thanks to the weekly one-pager. What routines are in place in your classes to help build students’ writing fluency? I was wondering if you could so kindly share the framework, guidelines, suggestions for the one page weekly mini-papers. I definitely see the value in this and would love to attempt something similar with my sophomores. Thank you in advance! Shana, I love that you still ponder the conversations we had this summer. Me, too! I am totally with you on the need for students to build fluency. For the longest time, when I first started doing writers’ workshop, I thought having students free write or respond in their notebooks was enough. I quickly learned that without concerted practice and paying attention to mechanics, form, style, and all that, students were not becoming better writers. Yes, they could write quickly, but they were not transferring the skills we were learning to show me they were writing well. It’s when I get students to take their thinking from their notebooks to somewhere else — in my case as a blog post — that I start to see that their fluency doesn’t just include writing more, it means they are writing better. Are your students blogging? If yes, we should have our students team up. We do a weekly one page responsse to an Article of the Week, write poetry, as well as craft short stories every few weeks. You mention “frequent follow-up and sharing activities we do in class with these writings”. Could you elaborate a bit more these activities and how you do them?